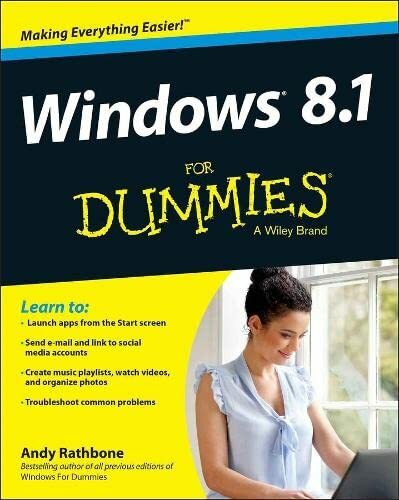 The bestselling book on Windows, now updated for the new 8. 1 features Microsoft has fine-tuned Windows 8 with some important new features, and veteran author Andy Rathbone explains every one in this all-new edition of a long-time bestseller. The bestselling book on Windows, now updated for the new 8.1 features Microsoft has fine-tuned Windows 8 with some important new features, and veteran author Andy Rathbone explains every one in this all-new edition of a long-time bestseller. Whether you're using Windows for the first time, upgrading from an older version, or just moving from Windows 8 to 8.1, here's what you need to know. Learn about the dual interfaces, the new Start button, how to customize the interface and boot operations, and how to work with programs and files, use the web and social media, manage music and photos, and much more. You'll even find troubleshooting tips! * This edition covers the upgrades in Windows 8.1, including the dual interfaces, basic mechanics, file storage, and how to get the free upgrade to Windows 8.1 * Shows how to manipulate app tiles, give Windows the look you choose, set up boot-to-desktop capabilities, connect to a network, and create user accounts * Covers working with programs, apps, and files; using the Internet and social media; new apps and capabilities for working with onboard and online media; and how to move files to a new PC * Written by Andy Rathbone, author of every edition of the bestselling Windows For Dummies Windows 8.1 For Dummies is exactly what you need to get going and be productive with the newest Windows update.